The Syrian Air Force has destroyed a warehouse in Idlib province, where ammunition dump containing chemical weapons was being produced by militants before being delivered to Iraq, the Russian Defense Ministry spokesman has said. The warehouse was used to both produce and store shells containing toxic gas, Konashenkov said. The shells were delivered to Iraq and repeatedly used there, he added, pointing out that both Iraq and international organizations have confirmed the use of such weapons by militants. The same chemical munitions were used by militants in Aleppo, where Russian military experts took samples in late 2016, Konashenkov said. The Defense Ministry has confirmed this information as “fully objective and verified,” Konashenkov added. According to the statement, Khan Sheikhoun civilians, who recently suffered a chemical attack, displayed identical symptoms to those of Aleppo chemical attack victims. 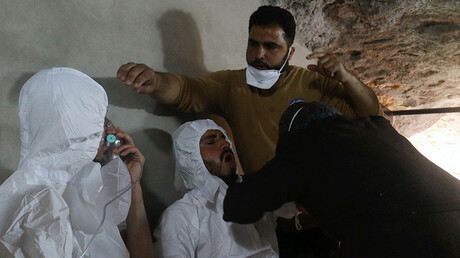 At least 58 people, including 11 children, reportedly died and scores were injured after a hospital in Khan Sheikhoun was targeted in a suspected gas attack on Tuesday morning, Reuters reported, citing medics and rebel activists. Soon after a missile allegedly hit the facility, people started showing symptoms of chemical poisoning, such as choking and fainting. The victims were reportedly also seen with foam coming out of their mouths. While the major Syrian opposition group, the Syrian National Coalition, and other pro-rebel groups put the blame on the attack onto President Bashar Assad’s government, the Syrian military dismissed all allegations as propaganda by the rebels. “We deny completely the use of any chemical or toxic material in Khan Sheikhoun town today and the army has not used nor will use in any place or time, neither in past or in future,” the Syrian army said in a statement. The Russian military stated it did not carry out any airstrike in the area either. However, EU foreign affairs chief Federica Mogherini, commenting on the incident, was quick to point to the Syrian government as a culprit, saying that it bears responsibility for the “awful” attack. US Secretary of State Rex Tillerson echoed Mogherini, accusing the Syrian government of perpetrating the attack calling it “brutal, unabashed barbarism.” He argued, that besides the Syrian authorities, Iran and Russia should also bear “moral responsibility” for it.